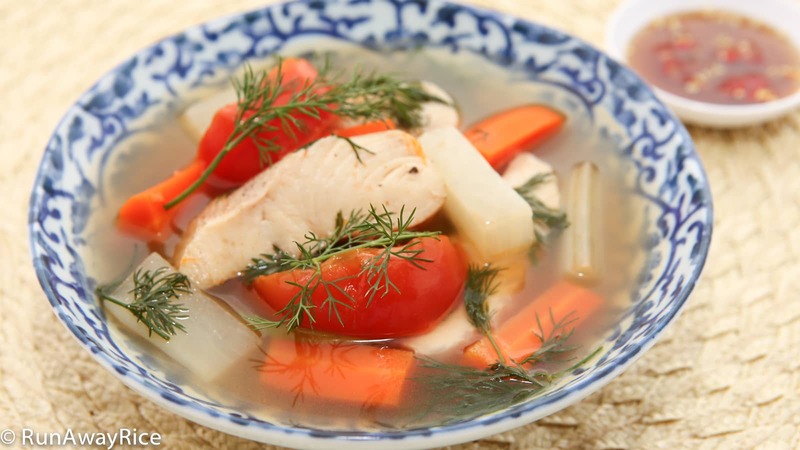 This delicious soup is all about the goodness of using fresh ingredients. Loaded with chunks of fish, carrots, Daikon radish, tomatoes and fragrant fresh dill, it’s a simple dish you can put together very quickly. If you’re looking for a new and unique soup your family will love, this is the recipe to try! The carrots and Daikon radish are a natural sweetener for the soup, so if you don’t have chicken stock handy, that’s perfectly ok. This soup is definitely substantial enough to be served as a main dish so enjoy it with rice or noodles for a simple and quick meal. Bon Appetit! Watch the video below for instructions. 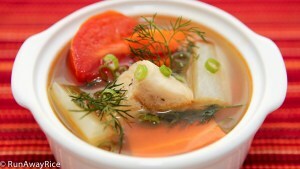 If you enjoyed this recipe, you may also like: Sour Soup with Fish (Canh Chua Ca). Peel the shallot and finely chop. Cut fish fillets into 1-inch wide sections and place into a bowl. Add 1/2 of the chopped shallots, 1/2 Tbsp fish sauce, ground black pepper and combine well. Allow to marinate while continuing with the next steps. Remove the skin from the carrots and radish. Cut into chunks approximately the same size. Cut the tomatoes into wedges. Cut off the white section of the green onions. Cut this section into slivers. Cut the green stems into 2-inch sections. Cut the fresh dill into 2-inch sections. Heat a skillet over Medium heat and when hot, add vegetable oil. Add the remaining chopped shallots and tomato paste and stir-fry for 15-20 seconds. Add the tomatoes and stir-fry for 2-3 minutes or until they just start to soften. Transfer to a plate and set aside for now. Put the carrots, radishes and chicken stock into pot and bring to a boil over High heat. Reduce the heat to Low and cook for 7-8 minutes or until the vegetables are soft. Add the fish and bring the soup to a boil again over High heat. Reduce the heat to Medium and cook for 5 minutes. During this time, skim off any foam and discard. Add the tomatoes and 1/2 Tbsp fish sauce. Combine together and cook for another 2 minutes and then turn off the heat. Add 2/3 of the fresh dill and green onions into the soup and combine. Ladle into a large soup bowl. Top with freshly ground black pepper. Garnish with the remaining fresh dill and green onions. You can never go wrong with the dill-fish combination. I used a whole bunch of dill, stalks (to flavor the broth) and fronds (to add at the end). Also, I used canned whole Roma tomato (to cut down on the preparation time) and baby carrot. This is a good weekday soup to keep in my recipe file since most of the ingredients are pantry staples.